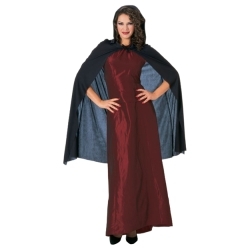 This hooded cape is the perfect start for creating a number of different Halloween costumes. You can use it for vampires, demons, creatures of the night, Little Red Riding Hood, spirits or ghosts. Cape is made of polyester and has an attached hood and ties. The 45” hooded cape is available in black, red, or white and measures 45” long.